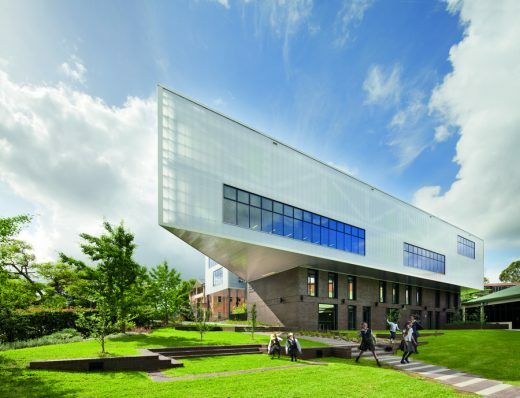 A research centre, a school and a church in Sydney have been selected by a distinguished group of American architects and educators in the International Architecture Awards 2013 that honour new and cutting-edge design. BVN Donovan Hill won two of the awards for The Kinghorn Cancer Centre in Darlinghurst, and for the Library and Resource Centre at Ravenswood School for Girls on Sydney’s north shore. The third award was given to FJMT for St Barnabas, Broadway that was rebuilt following a fire that devastated the original church. When BVN won the 2012 Sulman Architecture Award at the Australian Institute of Architects Awards it became the first architecture practice to win seven Sulman awards since the award was first given eighty years ago in 1932. It is 22 years since BVN received its first Sulman award, this latest award was given for the Ravenswood School for Girls, Mabel Fidler Building, that contains a Library and Resource Hub, in Gordon, Sydney. They also commended the introduction of a new language referring to the way the library is ‘suspended in the most translucent of structures’ with its daring cantilever over the school gardens. Mr Bill Dowzer, BVN Principal, commended his clients at Ravenswood, particularly the Principal, Vicki Steer, for their support through the creative and design process of this now highly acclaimed project. The new library spaces bear little relation to traditional library design, the focus is on flexibility and the opportunity for students to come together in large groups or retreat to quiet spaces for individual reading. A large timber stair, wittily called ‘La Scala’, is a surprising and dominant feature that serves the functional purpose of connecting two levels of the space and also acts as a grandstand providing seating to watch movies or a share a lecture. It also offers views across the library entry and out into the sports-field beyond. Importantly the new building finally provides Ravenswood with a new front door and real heart of the school. ‘Pedagogical theories and technology are rapidly changing the learning environment, and this building is a look into the future of education spaces,’ said Mr Dowzer. This win automatically puts the Ravenswood School for Girls, Mabel Fidler building on the shortlist for the National Architecture Awards to be announced in Perth on 1 November.